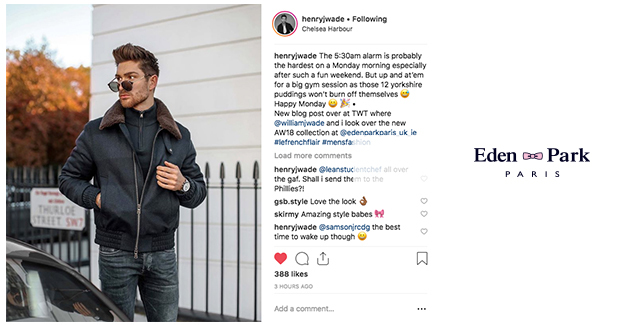 This autumn-winter season, two of the most popular influencers in London, have discovered the French Label Eden Park Paris. The brand invited them to go through the AW18 collection in our London showroom and as well in the event organised with John Lewis for the launch of the brand in Kingston. The twins appreciated the quality and the nice designs that Eden Park is offering to the UK market. As well, they said that they were impressed by the quality and the attention to the details on the brand. During the tour, they were explaining that they also find impressive the link of the brand with the England Rugby and how popular it is in the people that enjoy rugby around the world. Finally, when they try it different pieces of the collection they also find the fit Slim or Regular really comfortable and also how the shape of each style adapt to his body. 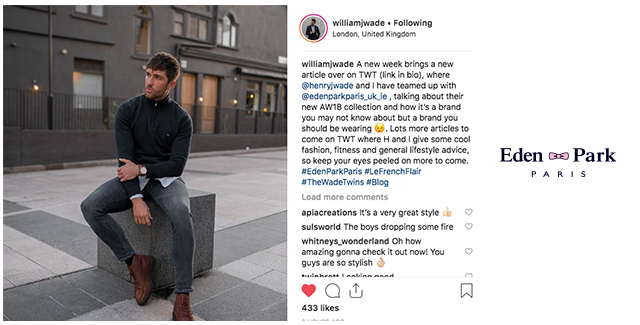 You can read all the incomes from the Wade Twins in the post on his website, www.thewadetwins.com, where they explain in detail the AW18 collection. For appointment to discover the new AW19 collection, please send an email to Marc Querol the UK Account Manager of Eden Park Paris – marc@doublehagency.com -.